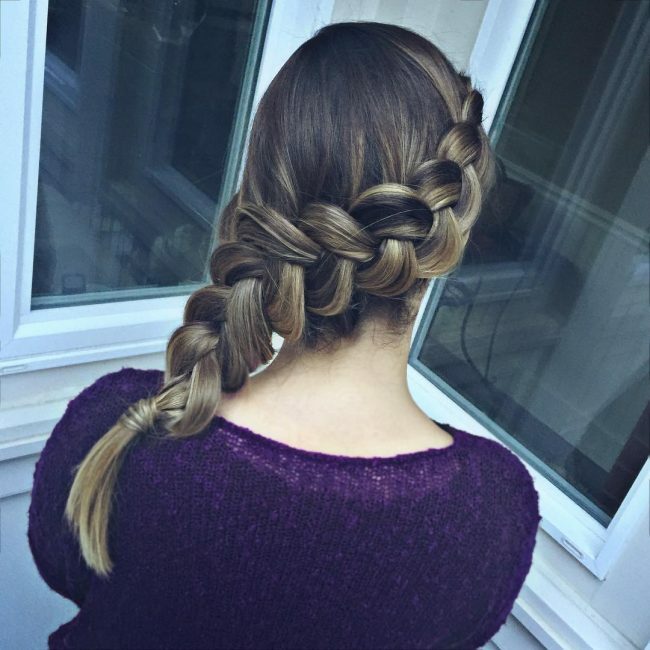 The Dutch braid is a design of braiding hair that most people like to refer to as the inverted French twist. It is very similar to the French design of weaving hair, but the biggest different between the two is the fact that the strands in the Dutch design interweave below the braid while the intersection is above the twits for the French style. Just like with any other type of twist, no one can claim to know exactly where it originates from because historical evidence shows that it has been around for thousands of years. However, the most reliable historical data indicates that these braids come from Africa, but the term Dutch comes from the fact that the Dutch people were among the first to wear this style. Their hair is longer, and they also have a different texture when compared to Africans who were the first to weave their hair, and so the Dutch had to adjust the conventional braiding technique so that it can work for their hair type and this is how this style came into being. This style has evolved through the years as more and more cultures embrace it, and there are now many variations. Below is a gallery of 50 pictures that will give you some examples of the limitless ways you can make this fabulous headdress. You can only achieve this elegant hairdo if you have a very long mane. And to create it you should pull the long strands into a ponytail and weave the strands coming from it into a huge pancaked twist that finishes with a simple pigtail. 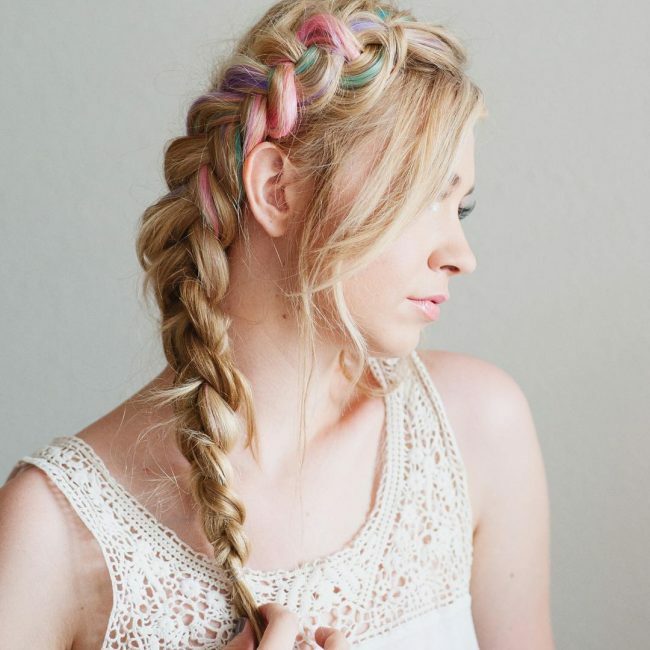 30 Stunning Side Braid Hairstyles — One For Every Day Of The Month! 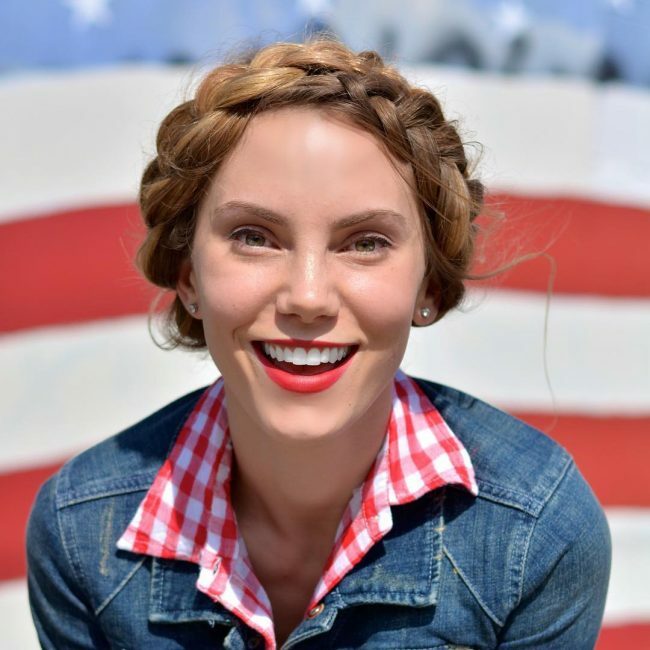 50 Lovely Braided Ponytail Hairstyles — French, Dutch, Fishtails, and More! Here is a simple version of the style that any woman can create. It entails weaving the strands into a small crown. You should also have two small braided buns at the back that you should make messy. This design is very inventive and also quite protective. It is also very straightforward and to create it you should weave three massive rows at the center of the head and then join them at the back into a fishtail. You should also spice up the fishtail by tying it into an elaborate pattern using rubber bands. Golden blonde is a beautiful color, and it gives these wavy locks an inspiring tone. However, this design also has a small twist that wraps around the head to add some elegance and beauty to the overall look. To create this fabulous headdress you have to divide your strands into two. 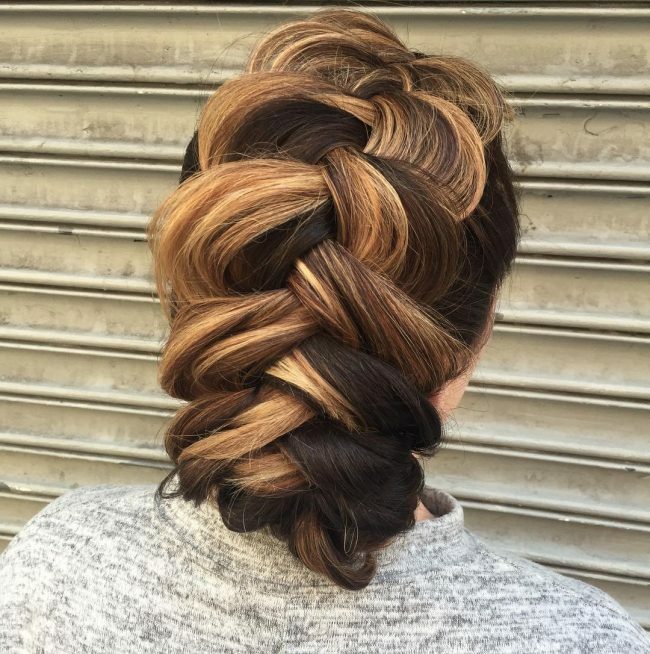 You should then weave each section into a beautiful Dutch braid. The twists are very simple, and any woman with basic braiding skills can create them. The beauty of this headdress comes from the skillful weaving of a neat twist that wraps around the head to create a fancy crown. 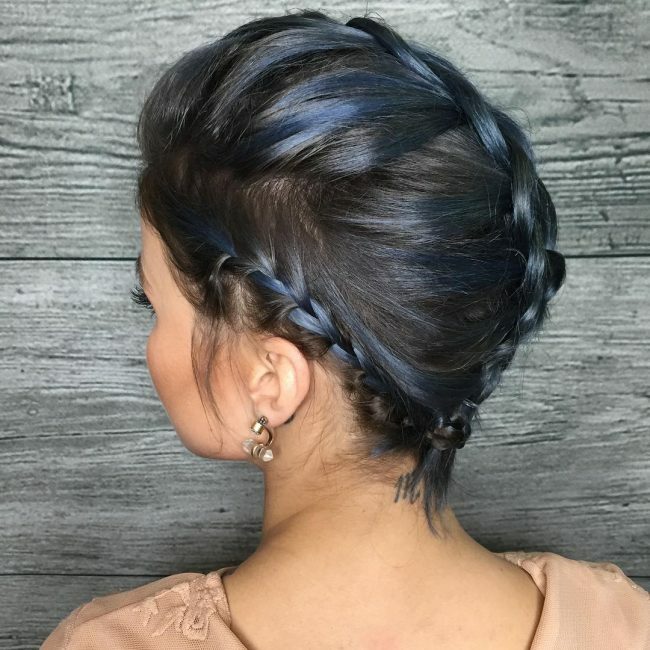 Apart from this the design also has a messy knot at the center of the head and a beautifully highlighted color that will make a woman look classy. This fancy headdress entails weaving your strands into a medium size twist that wraps around the head to form a beautiful crown. 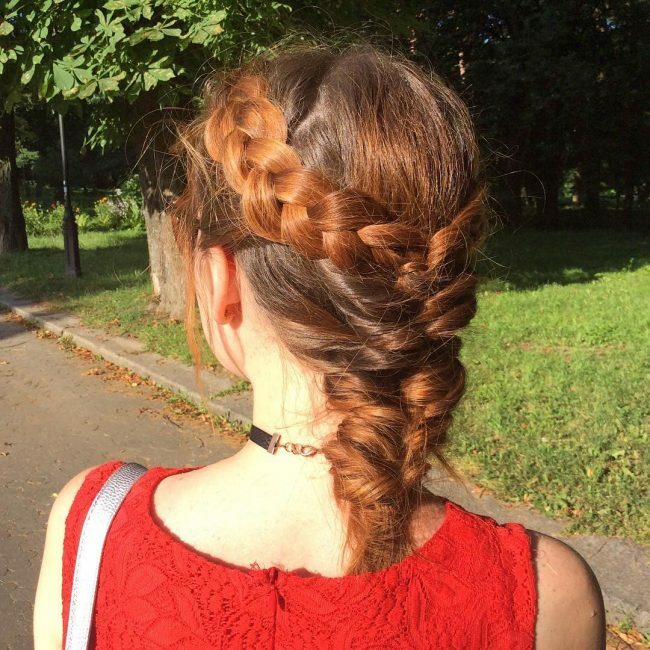 Although it is a typical braid crown its neatness and the color of the hair makes the hairdo look very distinct. It is always a good idea to try something unique like this one if you want to stand out from the rest. 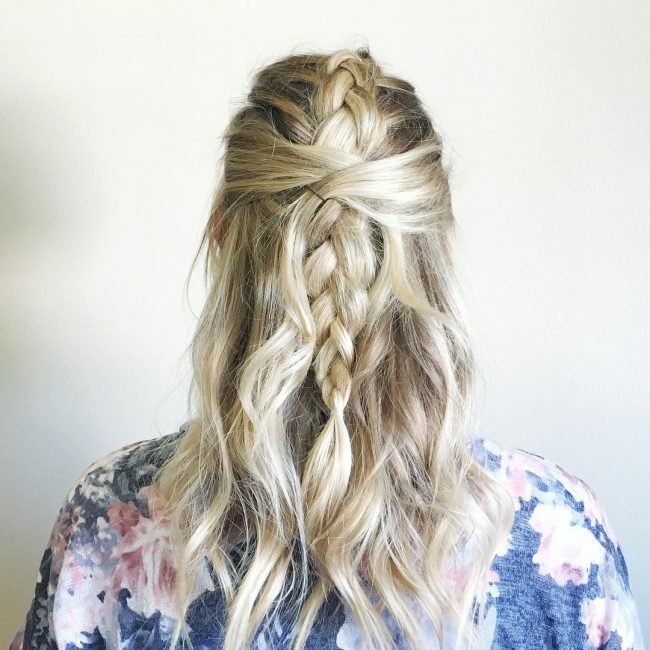 This design is also very easy as you only need to weave an upside down twist that starts at the back and ends in the crown where you should also have a messy knot. 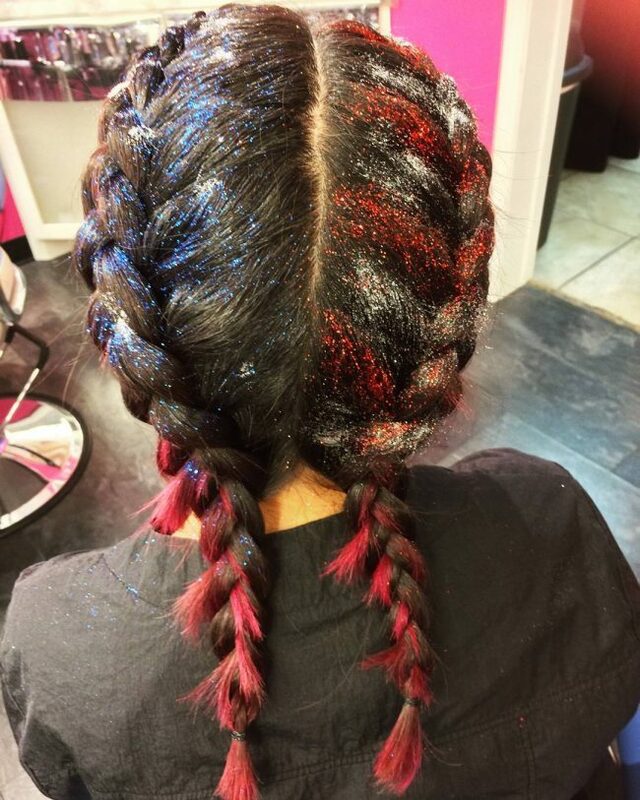 The blue and red glitters in this hair give it an incredible dazzle that makes it look very elegant. 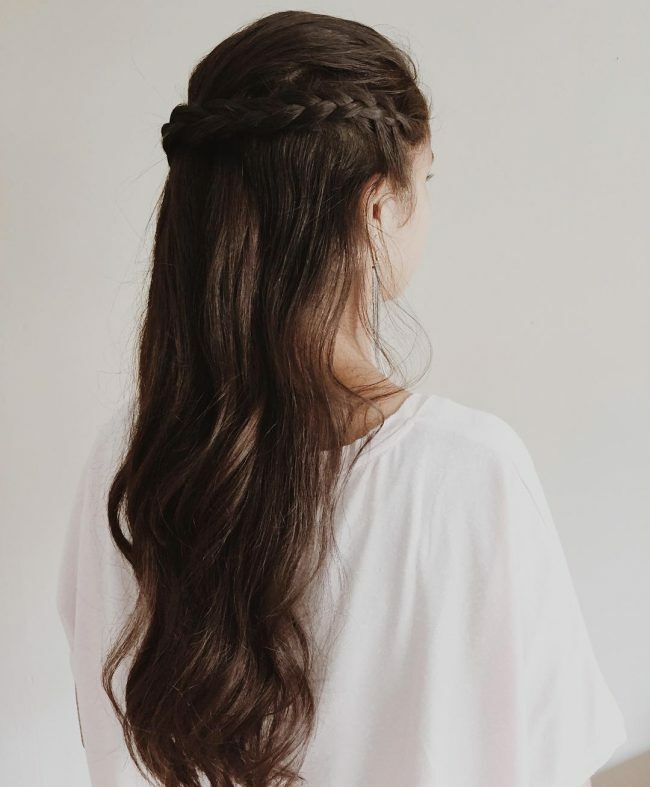 However, the strands also have a simple but cute braid design that entails sectioning the strands into two and weaving each part into a neat Dutch braid that flows to the back. There are so many things that you can do with your blonde locks to make them look stylish but few if at all any would look better than this. 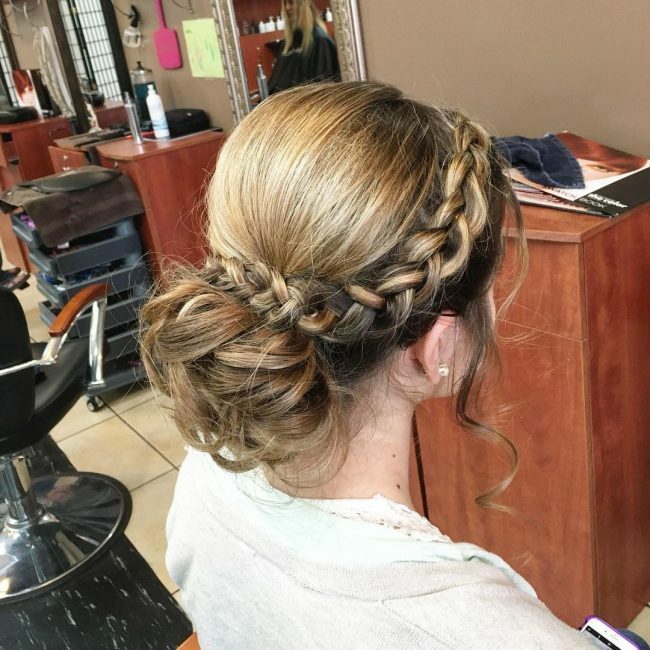 This sleek design entails weaving a medium size Dutch braid on the side and finishing it into a tight and elegant bun at the back. 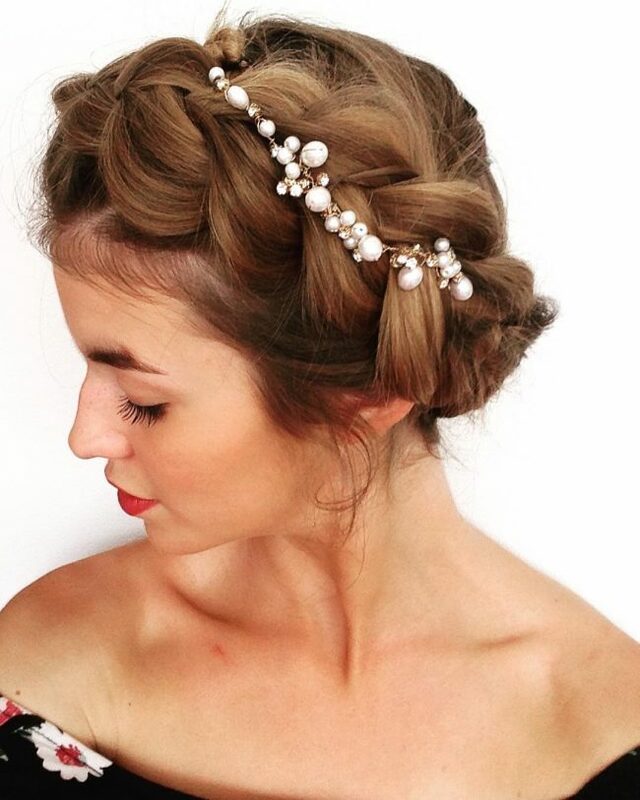 Whether you are going for a wedding or prom, a braided crown updo will be perfect for you. And you can have one like this that is not only impeccable but also lets you maintain some lovely free flowing locks below it. Beautiful and gorgeous are the two words that best describe this headdress. 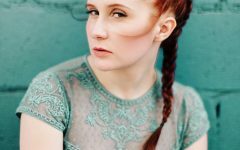 To replicate it you only need to brush back your strands and weave them into a fancy braid that starts from one side and flows diagonally to the other where you should finish it in a pigtail. 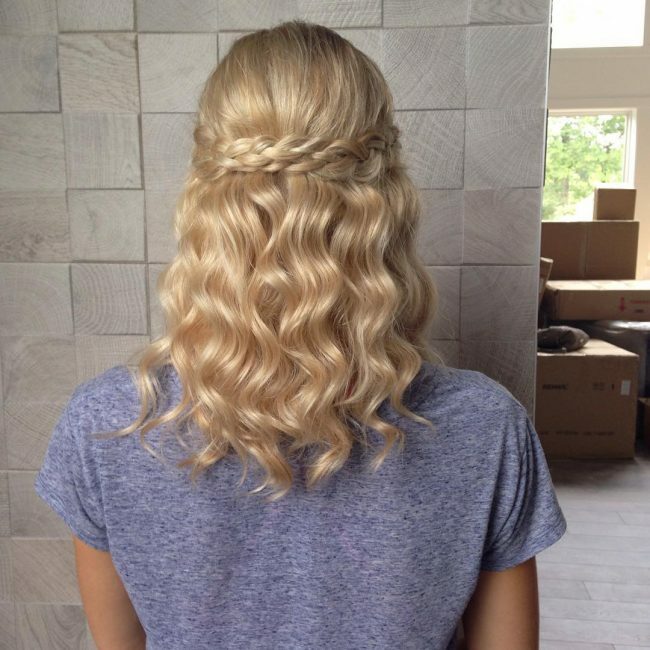 These natural blonde locks are stunning, and they have an excellent texture and some beautiful curls. 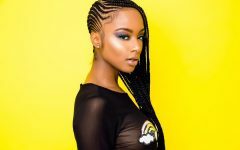 However, their styling is also top notch, and it entails weaving two fancy twists on the crown and finishing them in a knot at the center of the head. 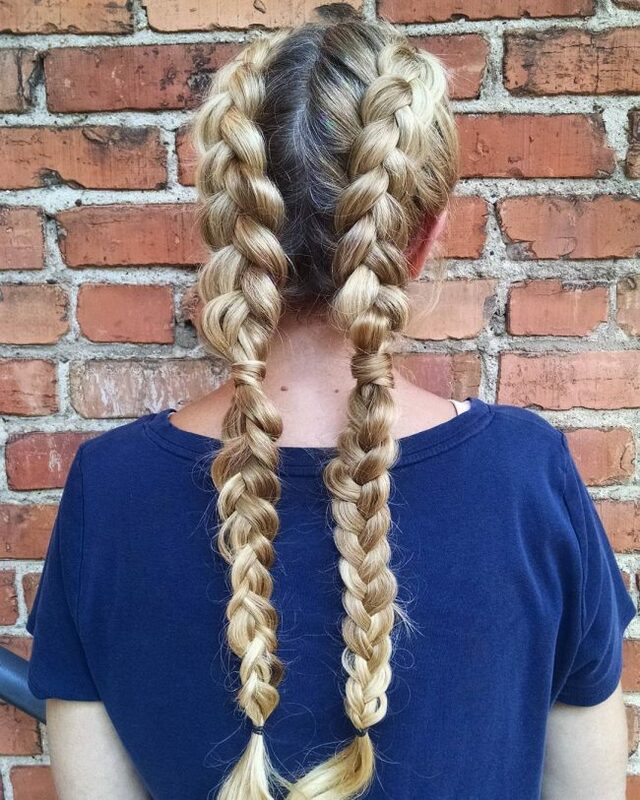 It is amazing how some simple, neat Dutch twists can transform your hair into something magnificent. These red strands have a very inventive twist design that starts with a center part at the front. 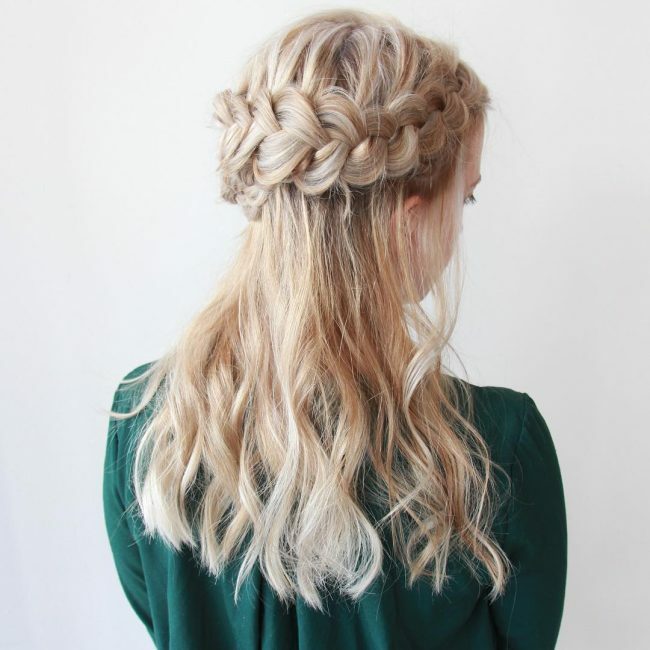 You should then weave each section into a medium size braid and join them at the back to form a lovely updo. 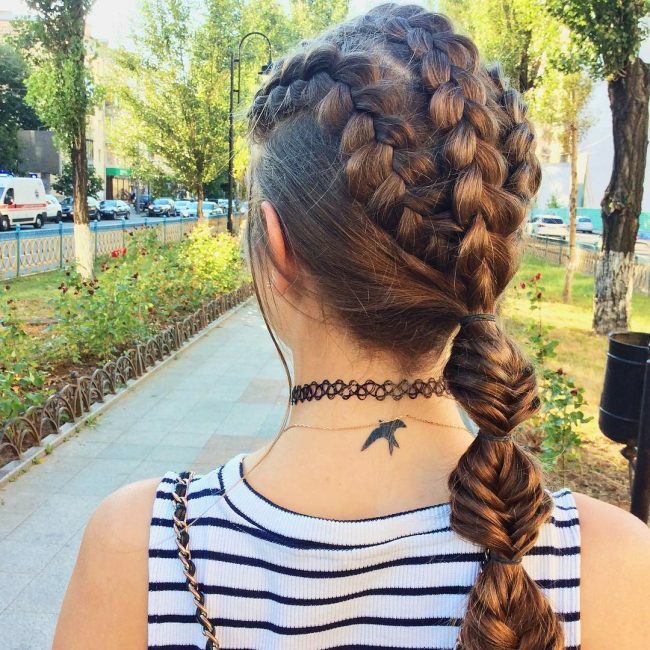 You should always try to keep up with the trend, and one of the latest in braiding is having two different types of twist in one hairdo. 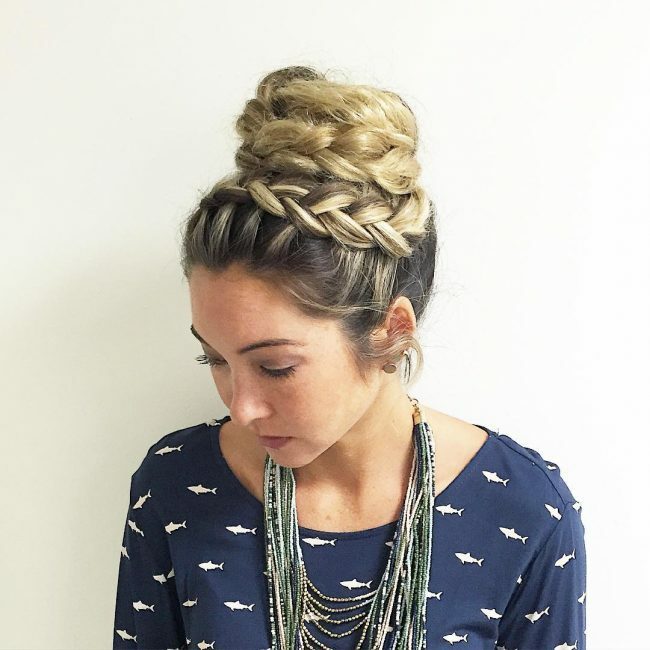 In this style, the headdress starts with a lovely Dutch braid, but it transitions to a simple fishtail to create an elegant appearance. It is hard to go wrong with a beautiful crown like this one. This headdress is also very simple because you only need to weave a massive Dutch crown and then accessorize it with some beautiful pearls to make the hairdo look trendy. 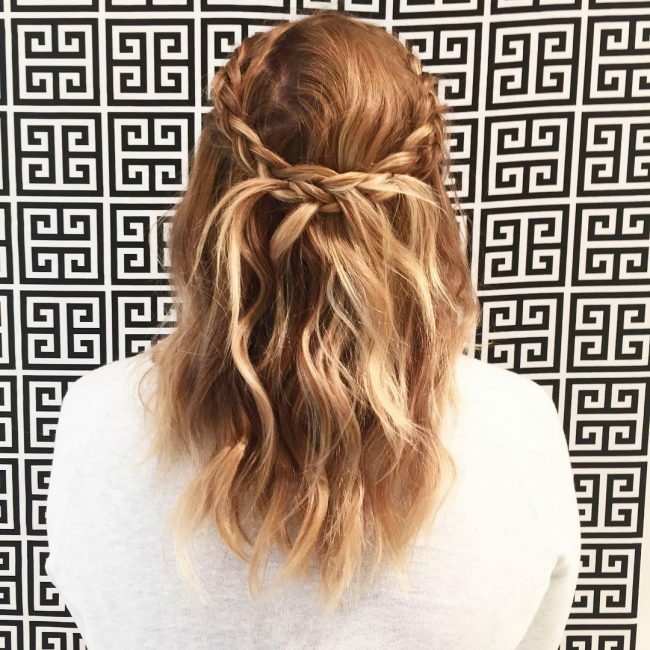 Your long curly locks may be breathtaking, but you can still take their appearance a notch higher with a beautiful braid. The ones on this design have a lovely side braid that makes them look very adorable and classy. 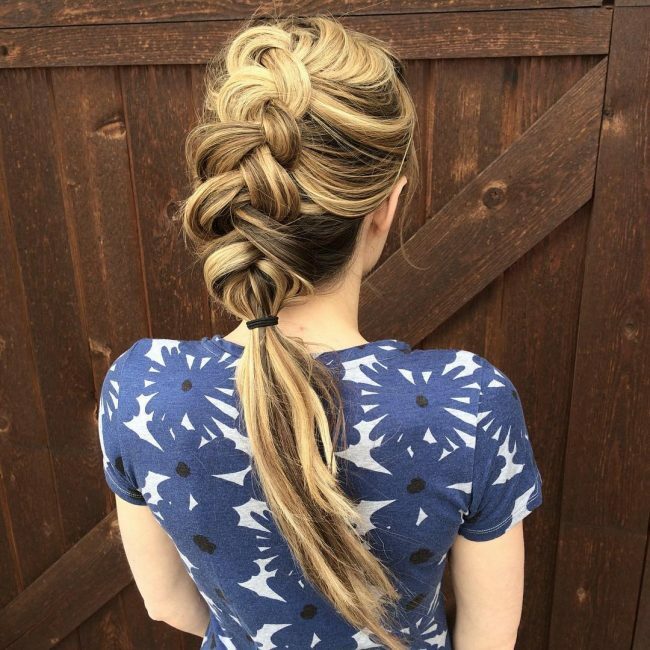 A Dutch braid is a very versatile design, and you can use it to create a very distinct look like this one. Here you have to section your strands into two and weave each one into a neat braid. 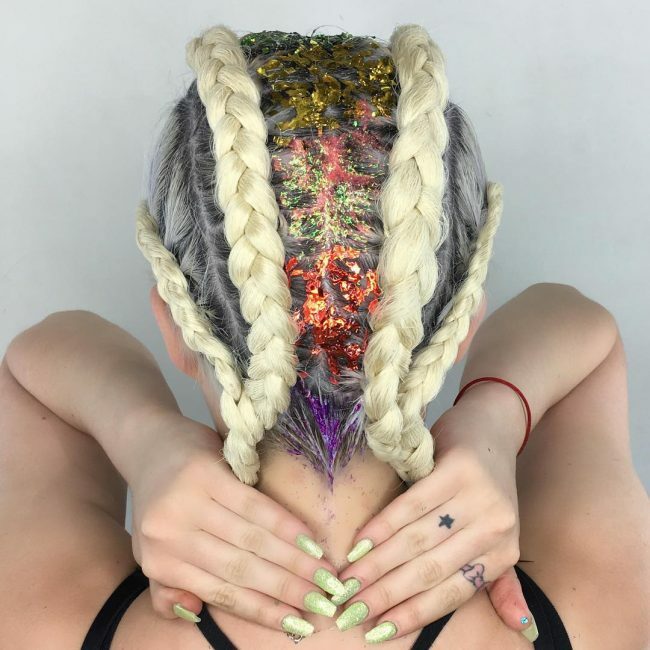 You should then join the twist at the back to form one free flowing lock and finish the design with some rainbow glitters between the fancy twists. This headdress proves that the length of your strands should not prevent you from wearing some lovely twists. It has beautiful Dutch twists on the sides and a simple rope twist that flows in the middle of the head. The strands also have a magical blue shade that makes them look exquisite. A straightforward updo like this one will also make you stand out. It entails weaving your strands into a massive and messy twist that incorporates all the strands but spins them slightly loose. 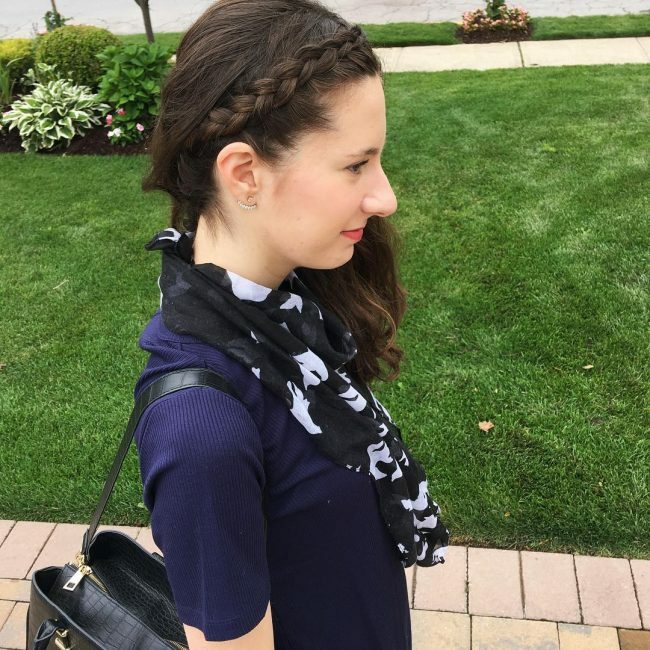 The good thing about a Dutch braid is that you do not have to make a long and complicated one for an elegant appearance. A simple one on the side that entails weaving a few strands is still enough to give you a very refined look, and it will also take a very short time. And if you also have some beautiful free flossing locks then you will look magnificent. Boho styles are not just easy to make, but they will look good on any woman who can form them. The ones on this design are only on the crown, and you should join them at the center of the head to create a polished look. 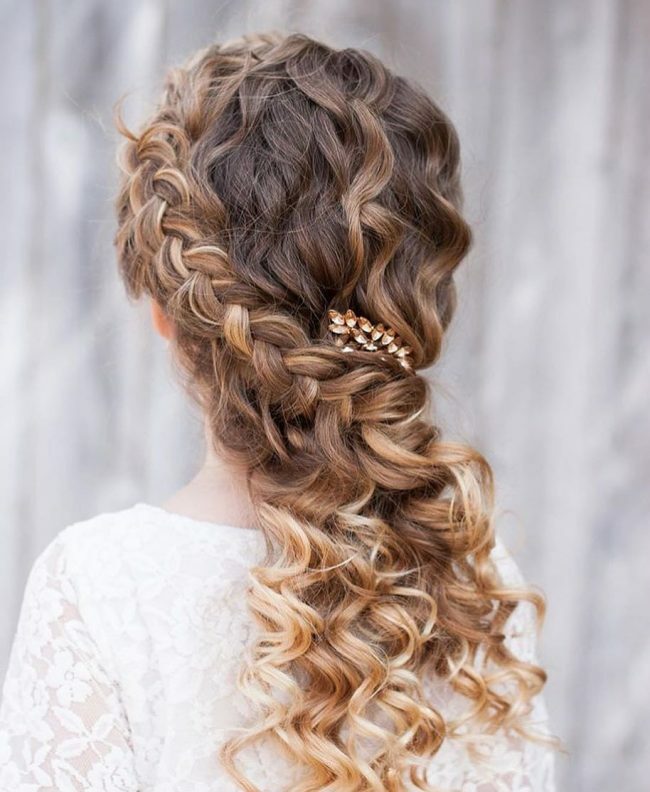 The long curly strands also have a good texture and some beautiful baby lights that also spice up the look. Rather than have a large crown you can keep things simple with a neatly braided headband like this one, You only need to weave a few strands to form it, but the best thing about it is the fact that you get to maintain the beautiful natural flow of your textured curly locks. 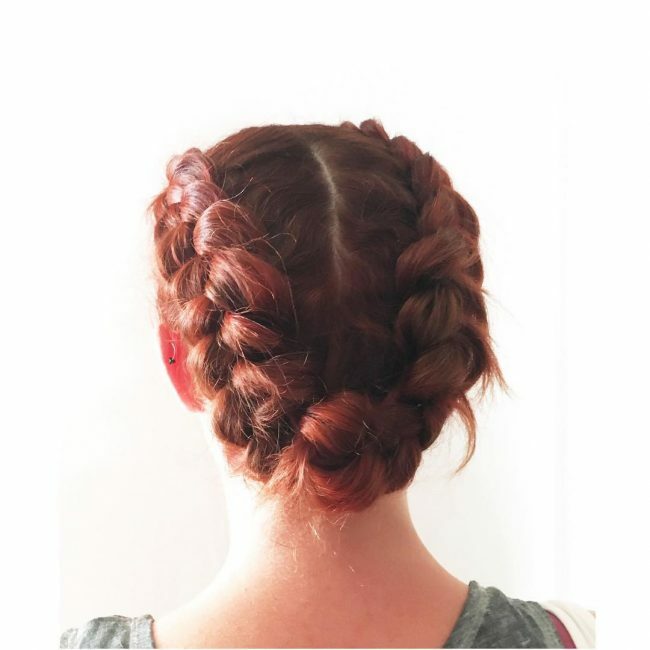 This headdress is one of the easiest versions of the Dutch braid that you can have. To create this style you should spin your strands to form a massive Dutch twist at the center of the head and finish it with a ponytail knot at the back. Mixing different types of braids in one hairdo is now very trendy, and it is what makes this hairstyle look splendid. This design starts with a simple twist on the crown that finishes with a knot at the center of the head. You should then weave the free flowing wavy strands into a few Dutch twists and fishtails to complete the look. The lovely red shade in this design gives the long strands a perfect tone and so if you also have a beautiful hairdo you can be sure of a top notch look. 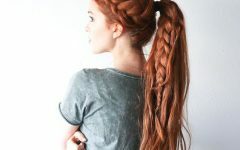 And to do this, you should weave a simple Dutch braid on the side and finish it at the back where you should also create a stylish tail braid. 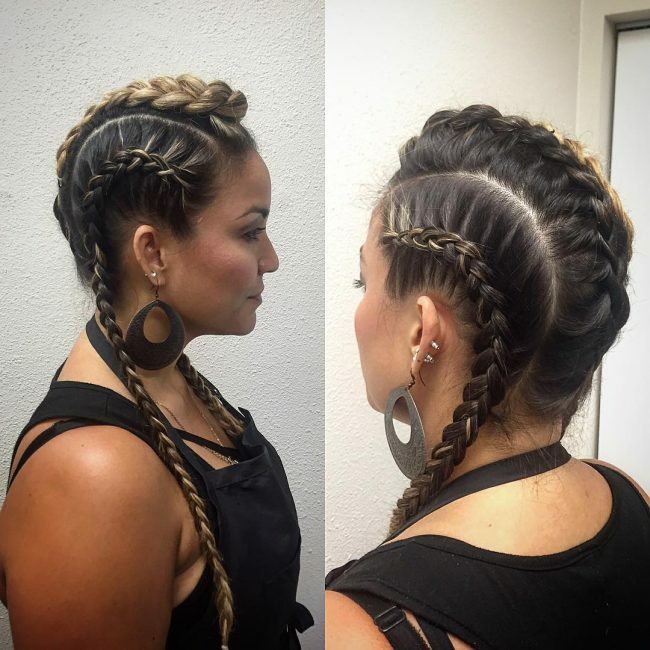 This beautiful style entails weaving three small twists at the center of the head to form a beautiful cornrow style. The cornrows should meet at the center of the head where they join to create a simple ponytail. If you are thinking of trying something new here is a style that will make you stand out from the crowd. However, it will only work for you if you have some long voluminous and highlighted locks. The design entails weaving your strands to form an intricate and tight twist in the middle and two long ones flowing on the sides and over the shoulders. 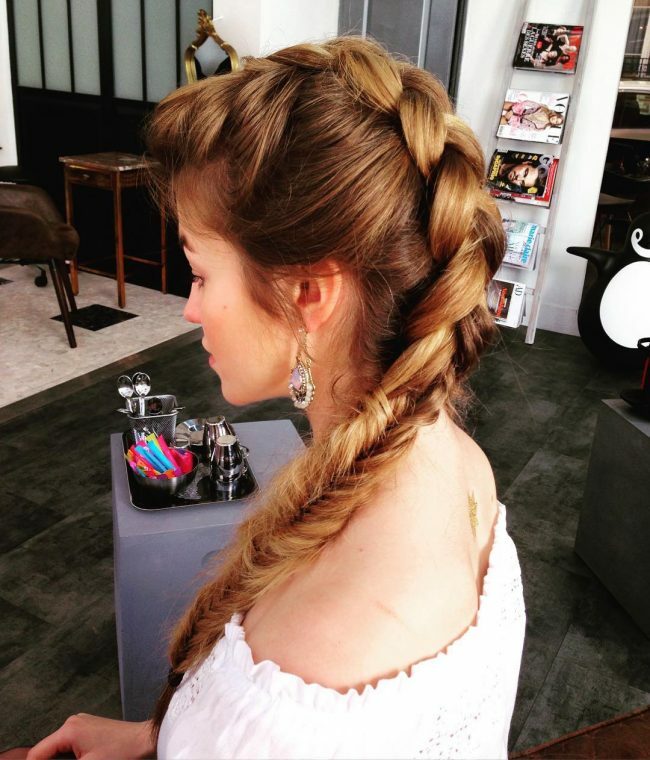 As charming as this braid style may look it is not very widespread, and so you can be sure that you will look unique. The design entails weaving some neat twist all around the head and pinning them in place to form a beautiful updo style. 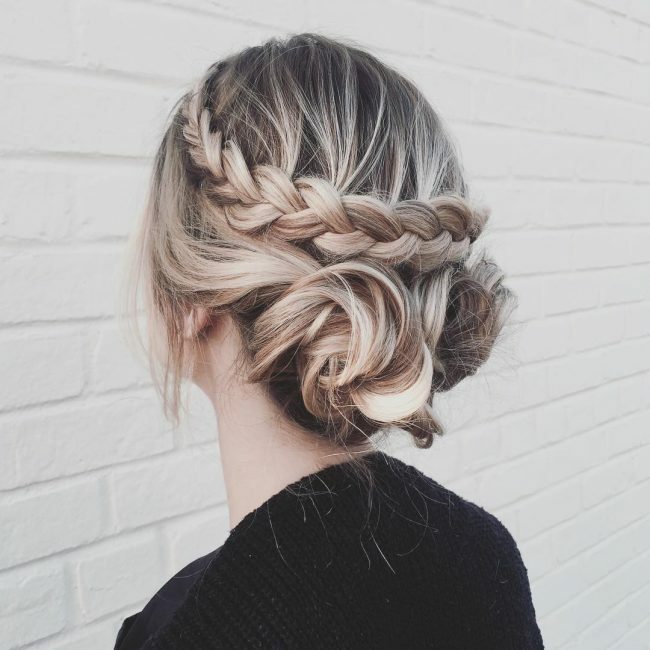 This elegant hairstyle combines a neat braid that starts at a center part and finishes at the center of the head where you should twist the strands into a neat and tight knot. The hairstyle also has a fancy side swept fringe. This fairy hair entails introducing some moderate pink, blue and purple pastels to your natural blonde hair to give it a colorful appearance. 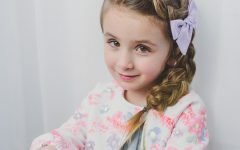 You should then weave the strands to create a beautiful side braid and also leave a few cute bangs handing over the face. 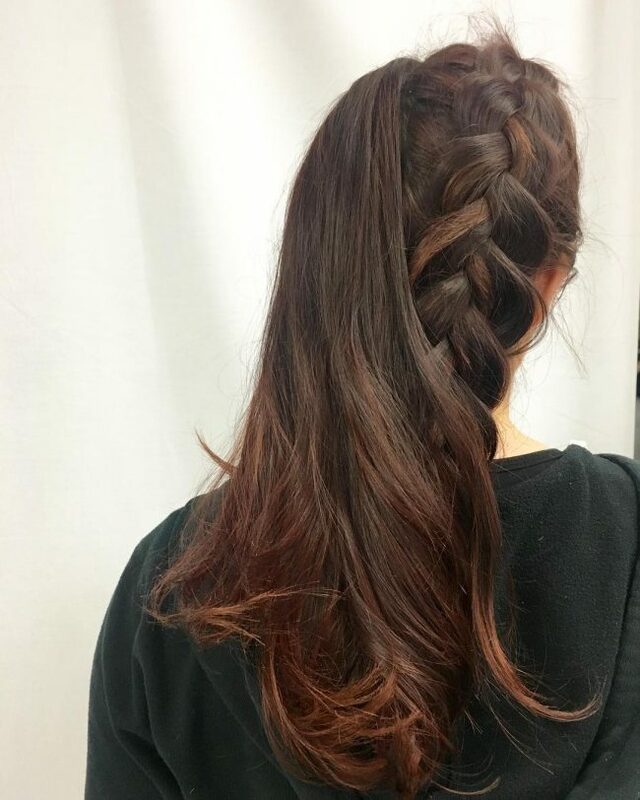 Chocolate brown is a cool shade, and it makes a huge difference for this hairdo. This crown braid is very ordinary, but the introduction of the chocolate brown hue makes it look very classy and fashionable. Braids make life easy for ladies because they make it possible to create refined hairdos without having to do much. A style like this one will only require a dye job to give the long locks their beautiful golden blonde shade. Once you have this excellent color, you should then divide the strands into two sections using a center part. The next and most important step is to weave each section into a neat Dutch twist and finish by tying the ends with a simple band to form some pretty pigtails. 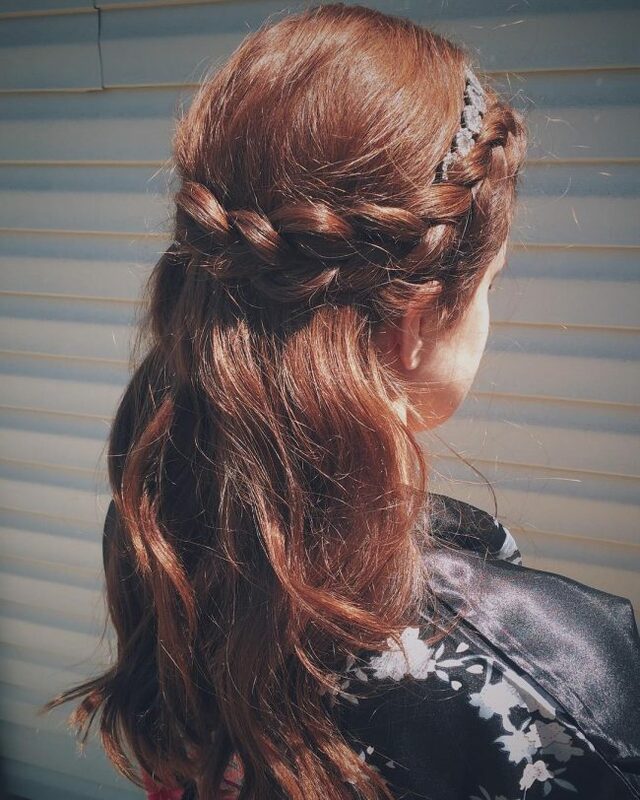 Crown braids may be everyday hairdos due to the ease of making them and their elegance, but you can still make one that looks unique. 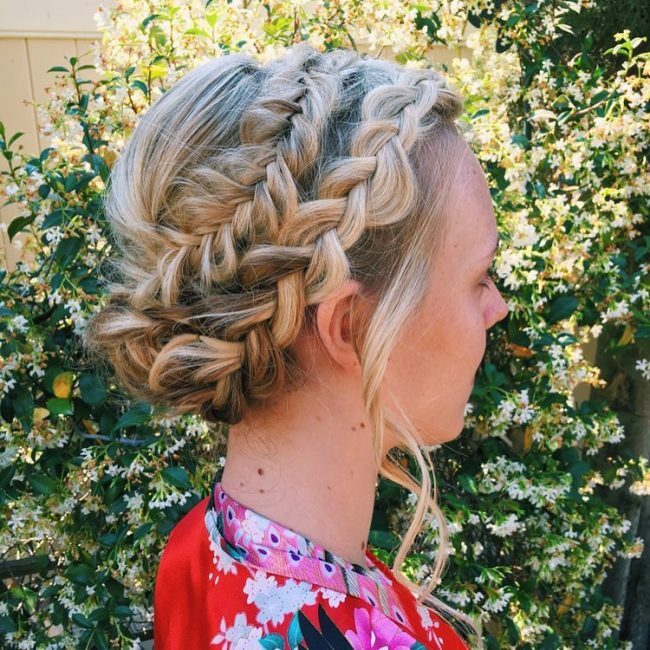 The one on this style is a perfect example of this, and it entails creating double twists that have a Dutch braid on the outer section of the crown and a fishtail above it. 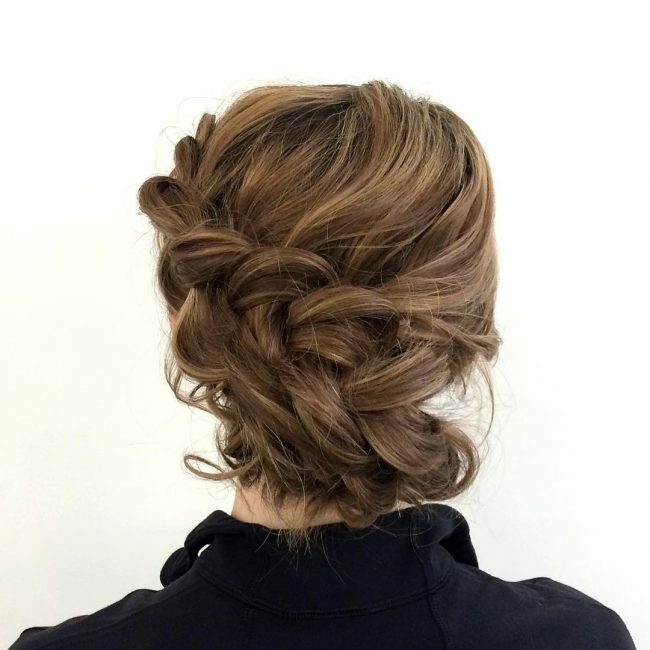 This formal braided updo looks stunning, and it is perfect for a lady with a textured long hair. 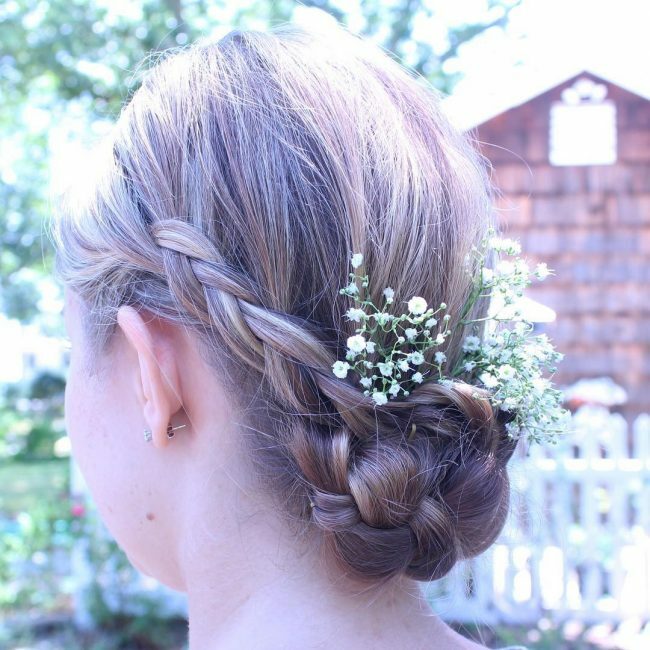 To form it you should weave a simple loose crown and then also have a messy bun below it. It is also a good idea to have a few bangs hanging on the sides as they help to enhance the design. A style like this one will help you control the flow of your long mane and make it look very stylish. To replicate it you should spin your strands into one massive Dutch twist and then tuck and pin it at the back to create an upstyle design. These strands also have a beautiful brown and blonde ombre color pattern that makes then look magnificent when you knit them. 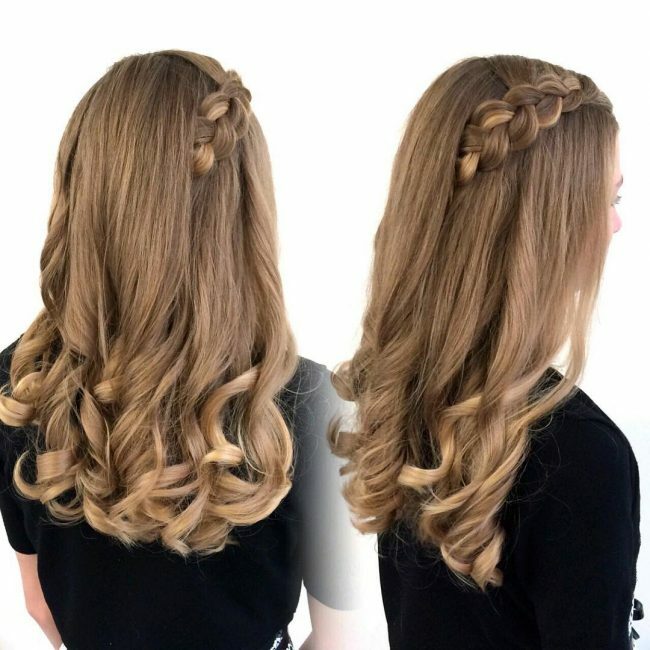 The blend between brown and blonde will always give you a unique hair color and with such a perfect shade you cannot afford to go wrong with the styling. 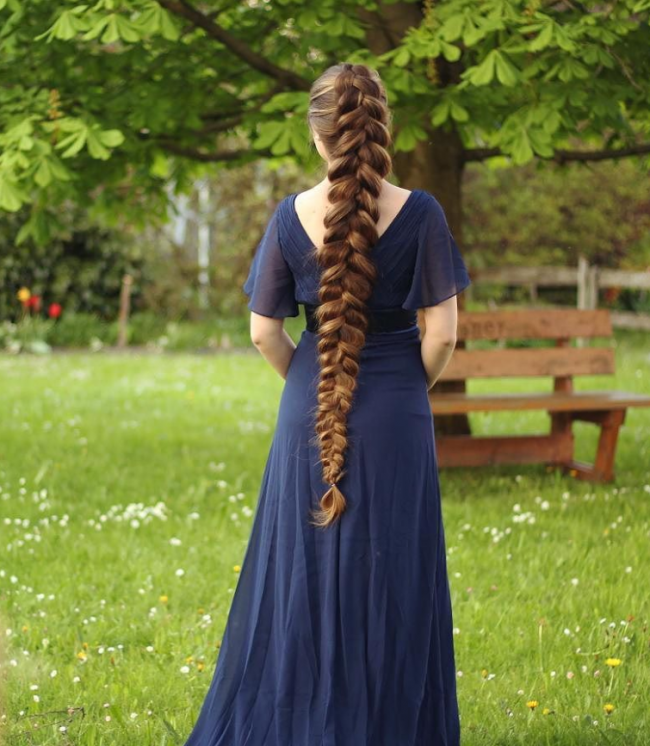 And if you prefer something formal you should go with a medium size braid on the side that ends at the back where you should pin it tightly in place. 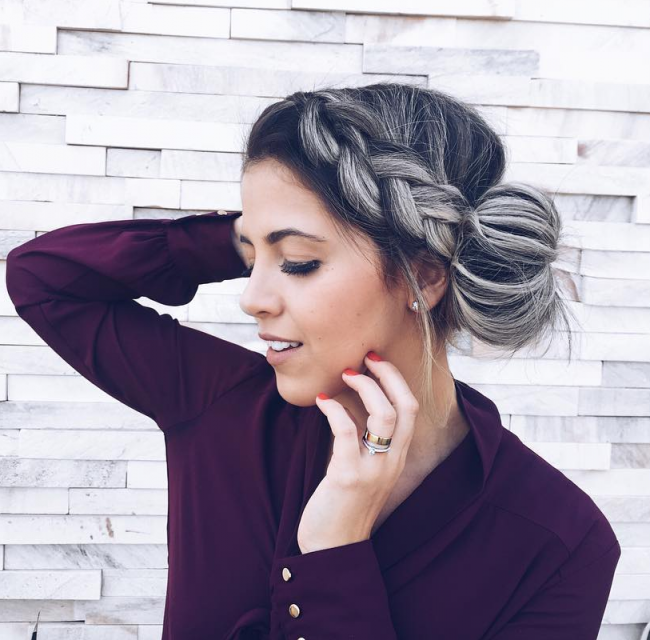 The silver gray shade on this hairdo is amazing, and it makes a huge impact on the style. Apart from this the strands also have a stylish twist on the side that you should finish at the back by creating a neat and tucked bun that will add to the elegance of the style. 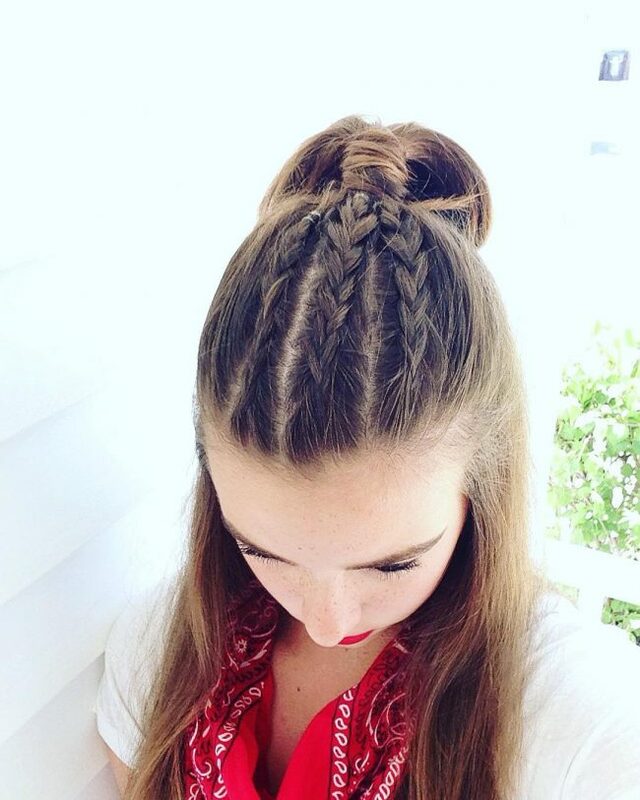 This hairstyle starts with two simple Dutch braids on the side that you should direct to the center of the head. You should then wrap the twist in the middle of the head to form a circular braided bun that looks very classy and stylish. Half up half down design enables a woman to control the flow of her mane while still having few beautiful locks flowing freely. 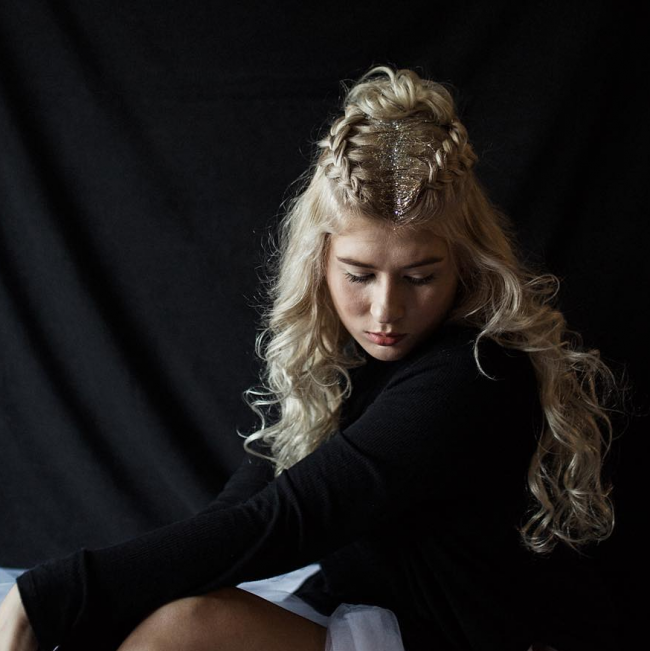 In this headdress, the look comes from introducing a medium size twist that wraps around the head like a crown and leaving some lovely blonde locks flowing to the back below it. Although this hairdo may look like a bunch of messy twists, it is still very elegant, and this is what makes it a trendy headdress. 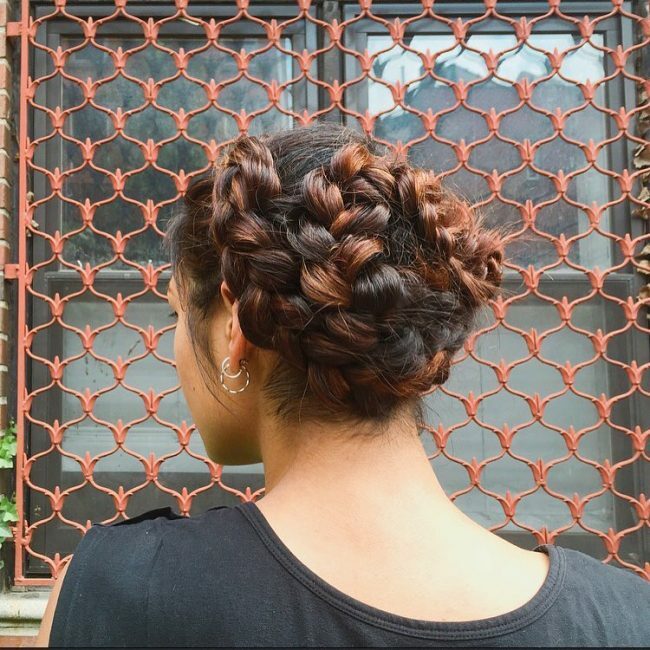 To replicate this look, you should weave two small Dutch twists on the sides and finish them in a huge textured and messy bun. Long textured blonde hair gives you unlimited styling options and with a little creativity, you can create stunning hairdos. 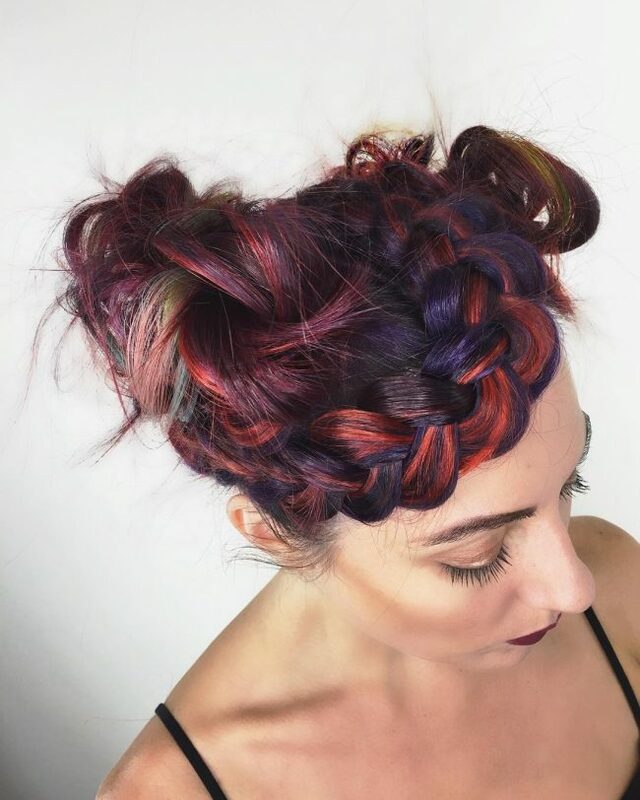 In this style, you should weave a medium size twist in the middle of the head and then introduce a twist above it to create a unique Mohawk headdress. These long wavy strands have a beautiful dark tone and texture that gives them all the elegance that you can ever wish for in your hairdo. However, the little wrap around braids at the top are also vital to the design because it makes it look classy and also helps to control the flow of the long mane. Your brunette strands may be naturally beautiful, but they still need innovative styling to look fashionable. 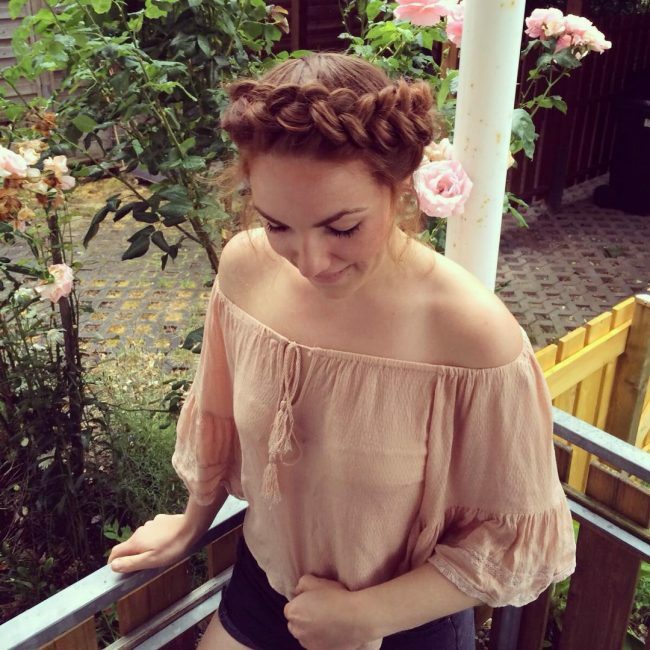 In this particular design, all that you need to do is to create a fancy Dutch braid headband that wraps around the head to create a charming headdress. 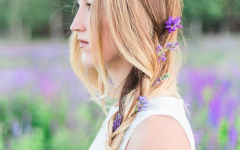 Braided updos are very stylish, and this is more so if you also have a lovely ombre hair like this one. 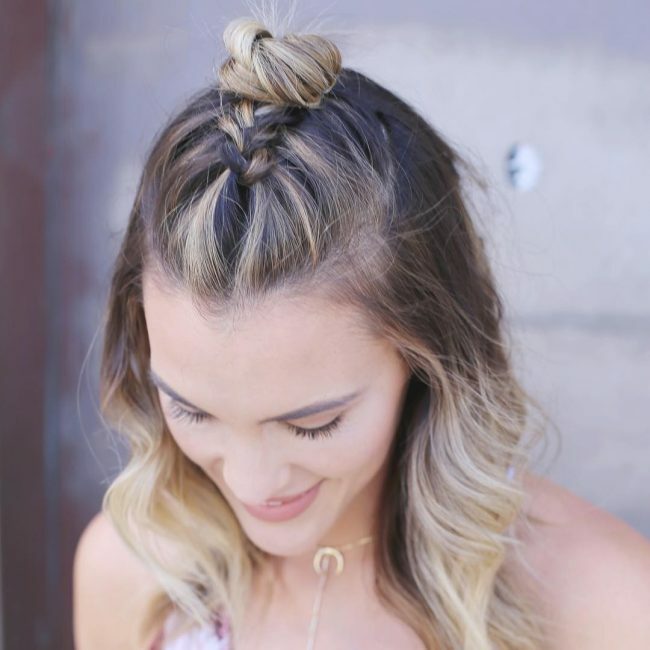 This hairdo may look hard to create, but you only need to weave your strands into a neat twist and then wrap and pin it into a neat and tight braided bun at the center of the head. 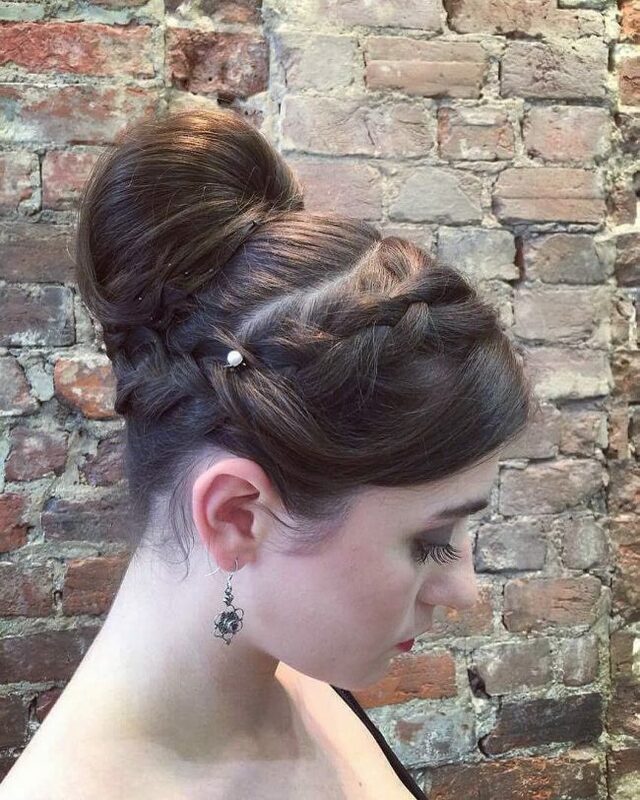 A unique hairdo like this one will turn heads everywhere you go and also make you the center of attraction in any formal event you may be attending. To replicate this look, you should have long textured strands that you should style into a mini twist on the crown that ends in a simple knot at the center of the head with the rest of the strands flowing freely around it. Chignons are a perfect option for any woman who does not wish to stick to the same old bun hairdos. This particular one also has some lovely twists on the sides that make it look very charming. 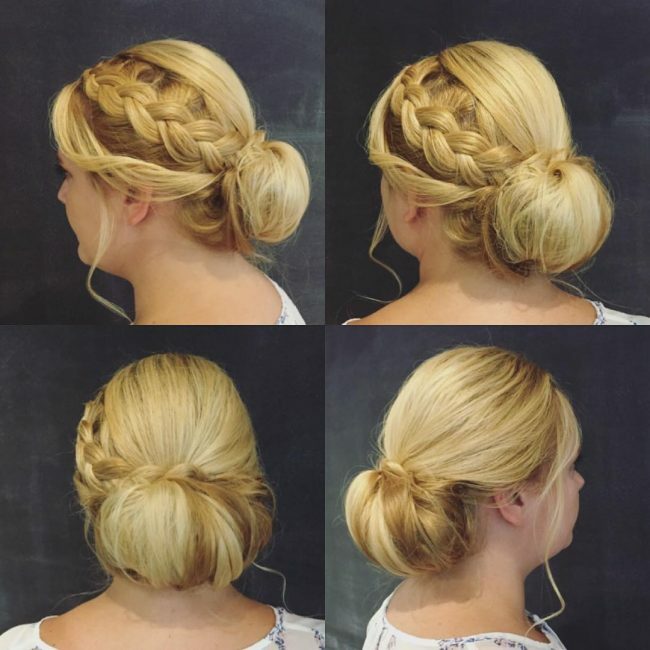 To create this look, you should form the side twists and finish them at the back in a small twisted chignon. These shoulder length blonde beach waves have an immaculate appearance that comes from texturizing them and sweeping them to the back. However, the two beautiful wrap around twists are the highlight of the design, and they help to form the half up look. The chocolate Sombre shade is the first thing that will catch your attention on this hairdo, but the styling is also excellent. 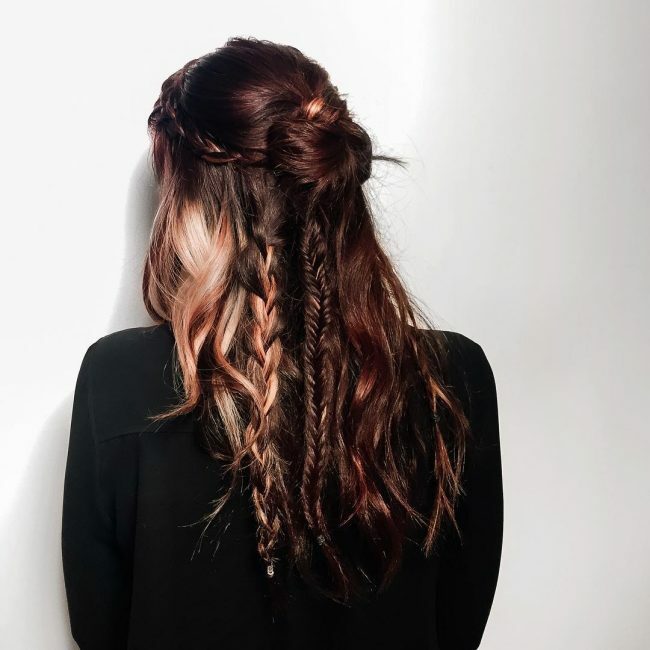 And it entails weaving a simple Boho braid on the side and then relaxing and sweeping the rest of the strands over the Boho twist to create an adorable windswept look. If you have the courage and time to try out a distinct modern headdress, then you can have this funky Mohawk design. This style looks very sophisticated, but it is still achievable if you use the services of an experienced hair stylist. 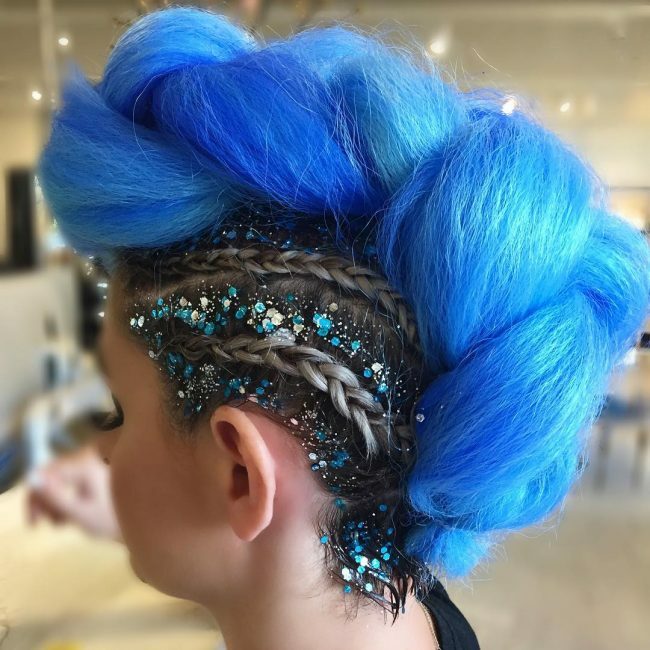 The design has some pretty small braid rows on the sides and a massive blue one in the middle. For the blue section, you can use some extensions if your strands are not long and voluminous. And to accessorize the design you will only need to use some beautiful glitters. 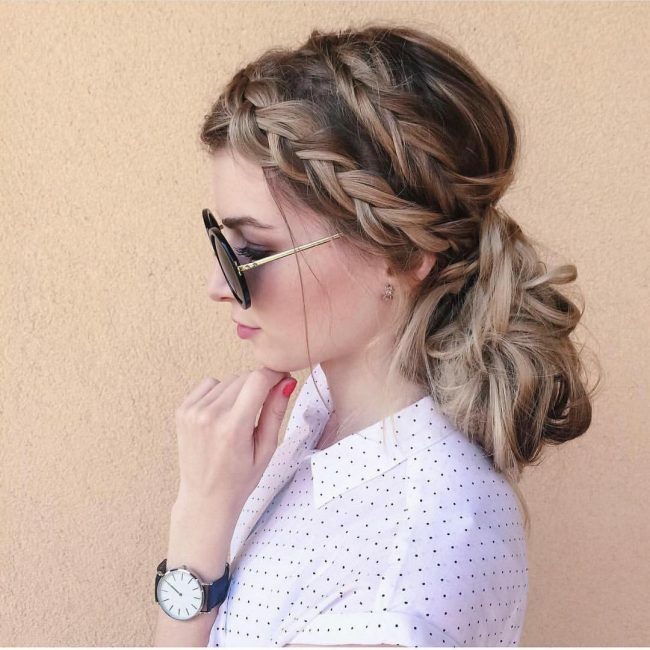 The Dutch braid is one of the most popular hairdos, and this is because it looks very refined and it never seems to go out of trend. And so if you are looking for something that will always make you look fashionable and trendy then it is a perfect idea. The picture gallery above will give you some ideas on the different designs you can try to look stylish in this headdress.